The staff of the Orange County Animal Shelter is privileged to announce our partnership with the Coffeewood Correctional Center located in Mitchells, Virginia. Entitled “Coffeewood Canines,” this flagship program became operational July 1, 2009, and is already proving successful in meeting the goals which it was designed to achieve. The Coffeewood Correctional Center, under the direction of Warden Samuel V. Pruett, has a history of promoting public service and now boasts a total of six (6) inmates trained as canine handlers by both the Virginia Department of Corrections and the Department of Homeland Security. With a successful track record of having qualified numerous detection dogs, these men are skilled canine behavior analysts. Under the auspices of Coffeewood Canines, six (6) dogs are selected from among those residing at the Orange County Animal Shelter and are transitioned into housing at Coffeewood where they undergo one-on-one training for up to six (6) weeks. Criteria for eligibility are social compatibility with other dogs and the potential to acclimate well into a family setting upon completion of the course. Aside from learning the basics of housebreaking, crate-training and the rudimentary commands of “sit,” “stay,” “down” and “come,” these lucky dogs are also educated in accordance with specific individual need or talent. Those demonstrating an aptitude for agility, for example, are taught to play fetch, to “wait” and retrieve their favorite toys upon command, to distinguish which ball is theirs and which are not. As each dog becomes acclimated, they are further taught the limits of proper indoor etiquette (stay off the furniture, no counter-surfing, no chewing) and are desensitized to crowds and strangers. For those afraid of thunder, who are head-shy or even living with a physical handicap, problem-solving and patience facilitate amazing change. On-site, Coffeewood’s new canine companions provide comfort, assuage loneliness and facilitate laughter with their antics. They present challenges, but also tangible measures of pride for their handlers as obstacles are overcome. Compassion, creativity and persistence are values promoted and visibly rewarded. In the public arena, the significant social contributions of the inmates related to Coffeewood Canines are evident far beyond affecting each dog’s personal growth. Canine graduates of the training program become ambassadors, representing the potential fulfilled that almost every dog has with the proper time and training. The plight of animals lost, abandoned or seeking sanctuary at local shelters is brought to the forefront through dialogue relating to Coffeewood Canines, resulting in increased adoptions. Successful placement of the animals is of invaluable assistance to the citizens, volunteers and staff of animal welfare organizations striving to save their lives. 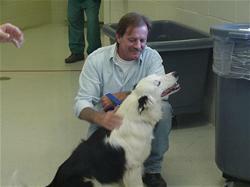 Our Animal Shelter staff is grateful to Warden Pruett and his exceptional staff for the opportunity to collaborate on this program and also wish to extend our gratitude to the following inmates for their hard work: Mike Woodward, Larry Martin, An Nguyen, Charles Shank, Jason Hibbs and to all who join in this effort. To date, more than one hundred dogs have found new homes thanks to Coffeewood Canines. If you would like to apply for adoption or are interested in additional information, please contact Gina Jenkins, Animal Shelter Director, by email or call (540) 672-1124. Profiles of available dogs may be found on Petfinder.com.